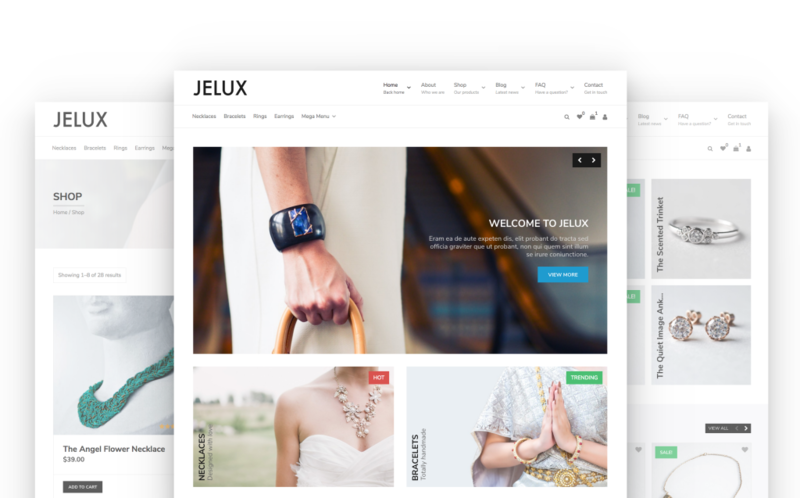 Jelux is a clean and modern Woocommerce theme specially designed for an online jewelry, jewellery, accessories, cosmetics, handmade, perfume, watch or makeup store but it can be used for any kind of online stores. Jelux comes with flexible custom page builder widgets such as slider, carousel, grid, testimonials. You can create your own unique page layouts, in a few clicks. Fully responsive, clean and modern design. Your content will scale perfectly to suit a wide range of screens, including tablets and phones. Rich set of customization options. Drag drop page builder (SiteOrigin) with easy to use custom widgets. You can create sliders, carousels, grid layouts, testimonials etc. in a few clicks. A wide range of layout options allow you to display your products or posts as you want. The post selector field of the post listing widgets, allows you to build a query to find products,posts or pages in the database with ease. Drag drop Mega menu support. Let your visitors save and share the products they love on your WooCommerce store with a Wish List. Second product image that is revealed when you hover over the main product image. Cover image feature lets you to add a different cover image to each product, post, page or category. Built-in FAQ (Frequently Asked Questions) system. Built-in social media sharing icons. Demo Xml File is Included.